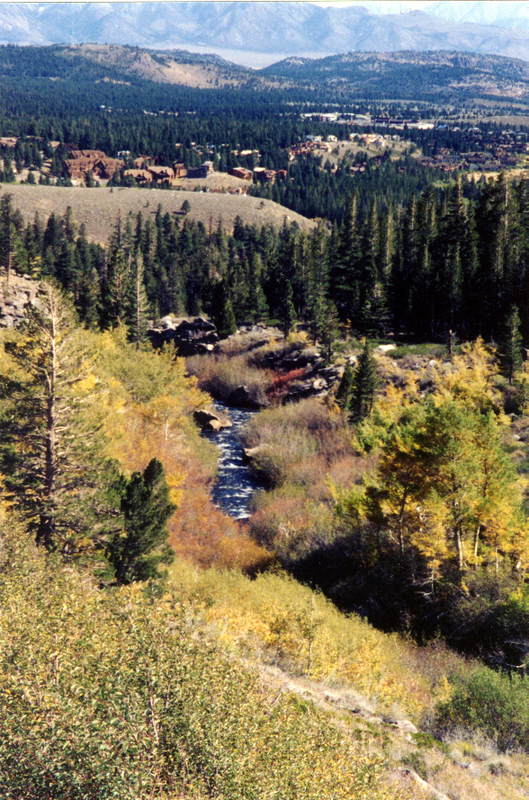 Above is my photo of Mammoth Creek. I worked for a commuter airline in the late 1980s and early ’90s that flew out of Los Angeles International Airport (LAX) to Mammoth Lakes, Calif., in the Eastern High Sierra Mountains, so, making the most of my good fortune, I spent as much time as I could exploring Mammoth Lakes, elevation 8,000 feet, and nearby Mammoth Mountain world class ski resort, elevation just over 11,000 feet. Even before I worked for the airline, the airline crew invited me to fly for free with them to Mammoth — and to the Grand Canyon, their other destination, where they flew mostly Japanese tourists. The airline personnel were among my customers on an Executive Lunch Route I ran for a catering company, selling sandwiches and salads to office workers. I ran the only route that had flight benefits. When the owner of the airline, who resembled Woody Allen, hired me, he said he did so because I wore shorts. Looking down on Mount Whitney from 15,000 feet. 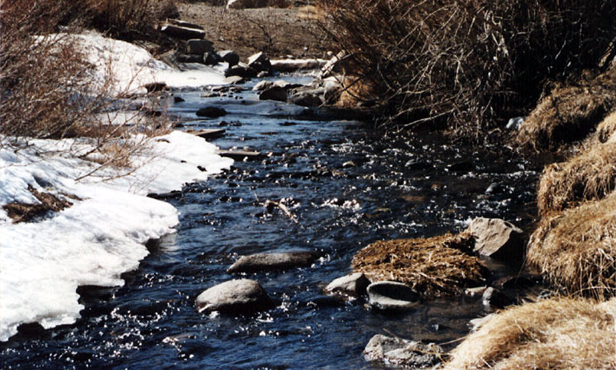 Mount Whitney is the highest summit in the contiguous United States, elevation 14,505 feet. Mammoth Airport. No, this isn’t our airline’s airplane. 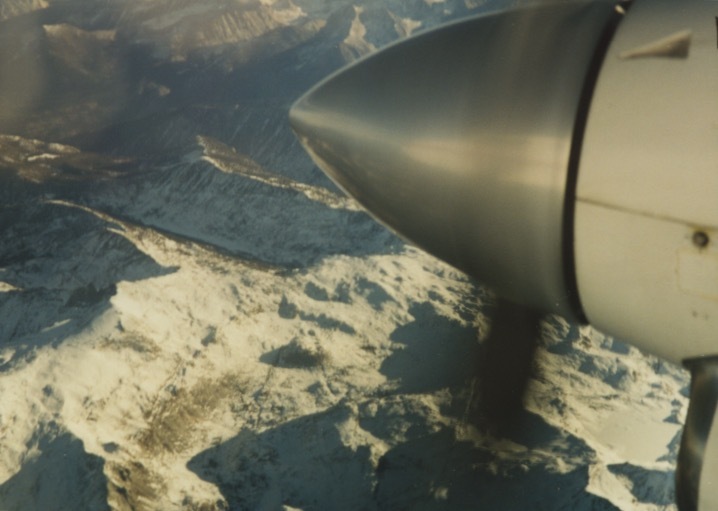 To Mammoth and the Grand Canyon they flew a Beechcraft 1900C, 19-passenger turbo prop, and a seven-seat Cessna 421 (piston engine). For the system of weights and balances, the Cessna could safely fly seven Japanese or five Germans to the Grand Canyon. 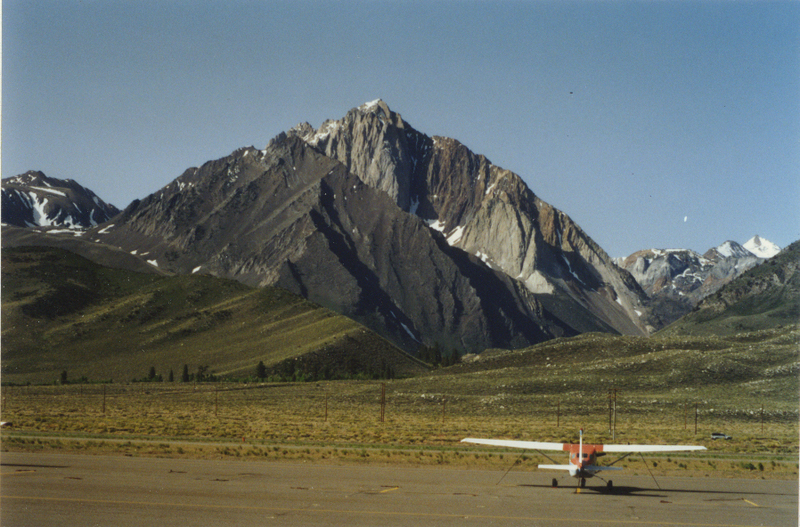 Sometimes we’d fly from Mammoth down to Bishop, a short flight of a few minutes. When you take off out of these airports you have to fly straight up, as best you can; otherwise, you’ll fly into a mountain. And the flight between the airports is bumpy, because of the crosswinds and drafts. 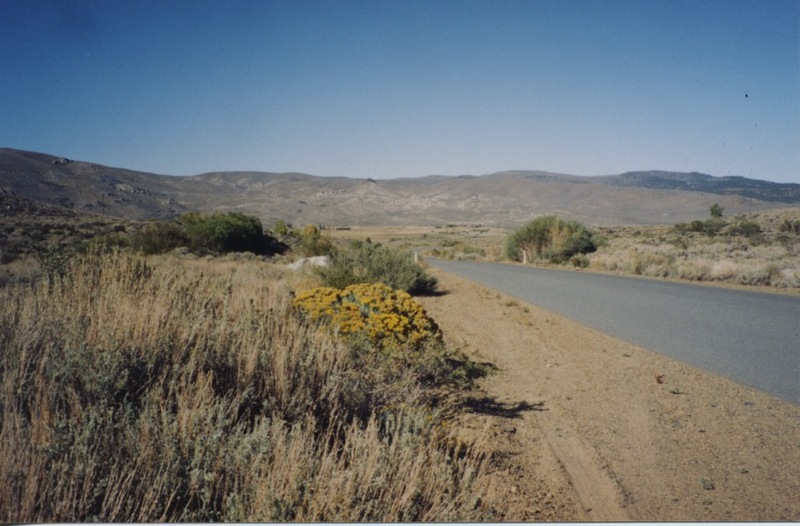 The mountain you see in this photo is Mount Morrison. 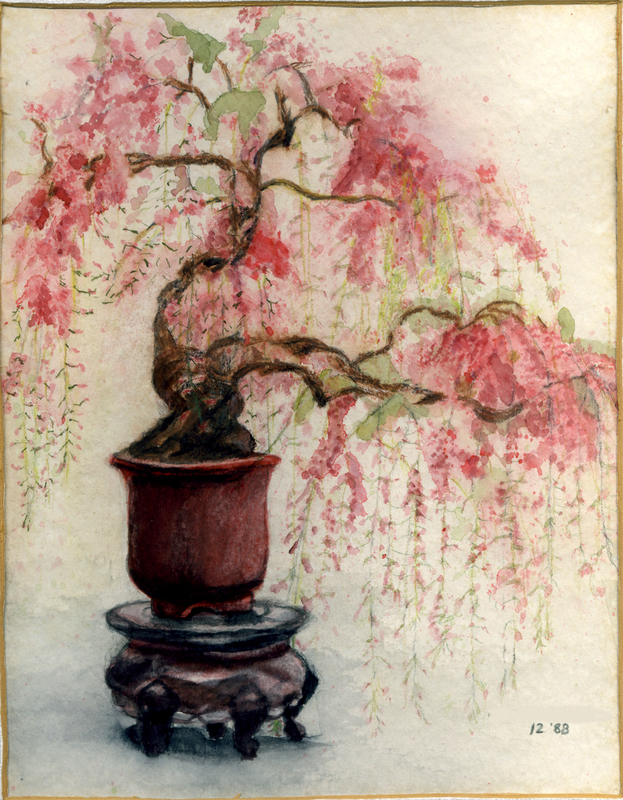 It has a storied history. 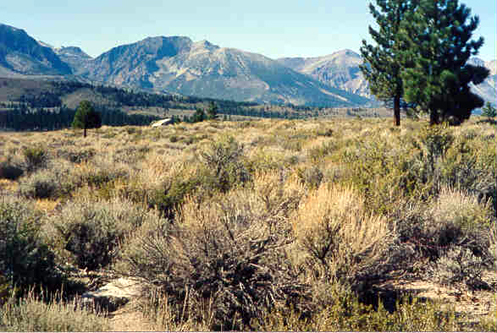 Behind it is Convict Lake, pictured below, where on September 23, 1871 a posse encountered escaped convicts from a Carson City prison. Robert Morrison, a posse member and Wells Fargo agent, was killed. The mountain was named after him. In February 1990 twelve teenagers and two counselors were on an outing at the lake. They fell through the thin ice. Three teenagers and four would-be rescuers drowned. Just before their deaths they had been warned that the ice was too thin to support their weight. 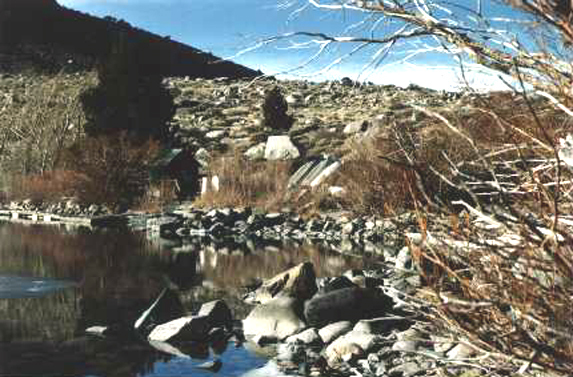 Movies have been filmed at Convict Lake. 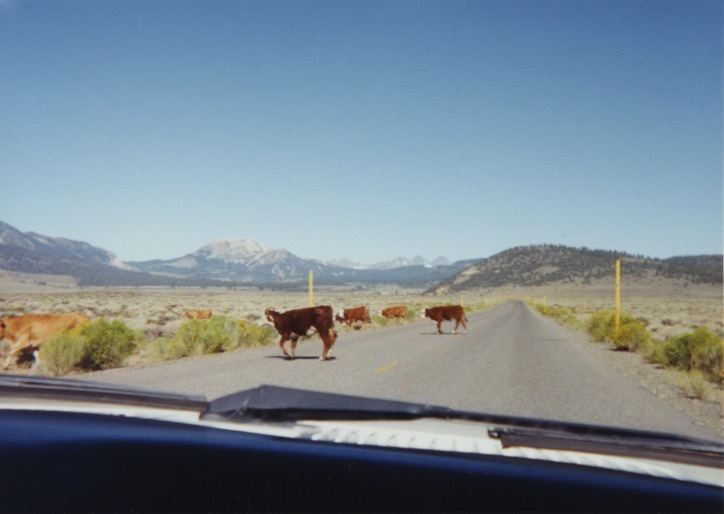 Driving from Mammoth Airport to the town of Mammoth Lakes. 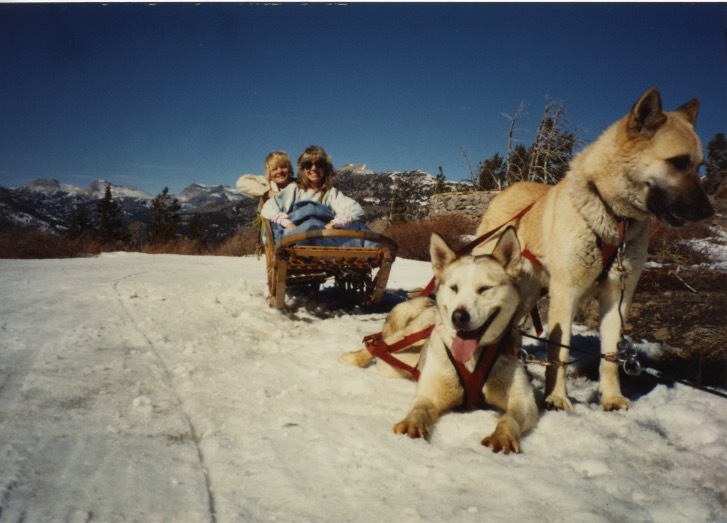 I went on a dog sled ride on Mammoth Mountain. A friend, Katherine, and I at the top of Mammoth Mountain, 11,053 feet elevation. 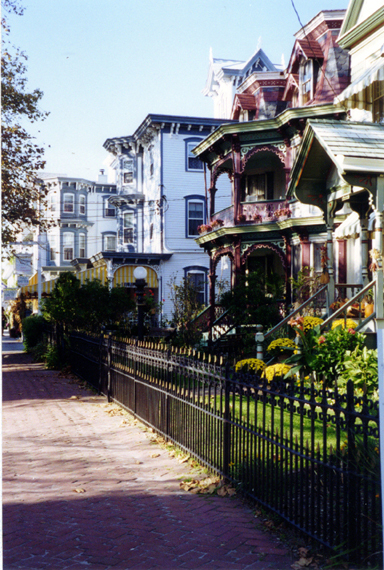 You may have seen car commercials made on this spot. 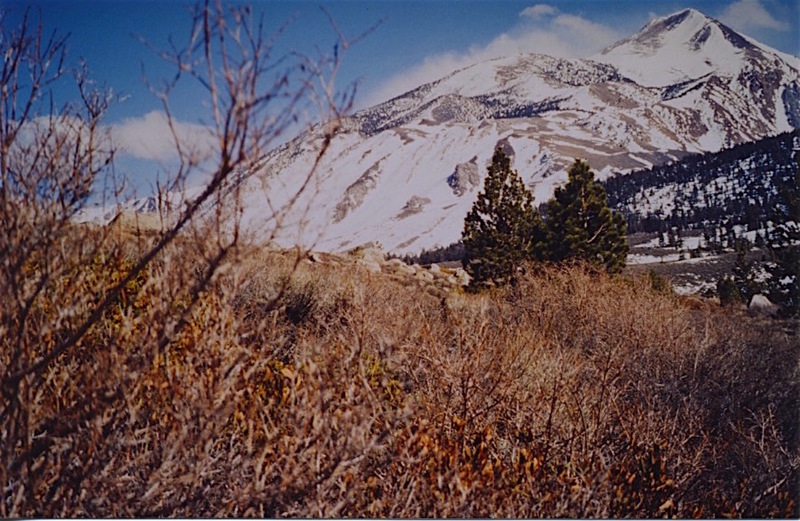 The Minaret Mountains are across the ravine behind us. Before motor powered vehicles, when someone was injured up in those mountains, they’d have to run a dog sled team up there to the rescue. The dogs don’t like to be still. They’d rather be pulling a sled. This was a warm day, temperatures in the low 50s F; the dogs had just pulled us about 3,000 feet up the mountain and they were resting. 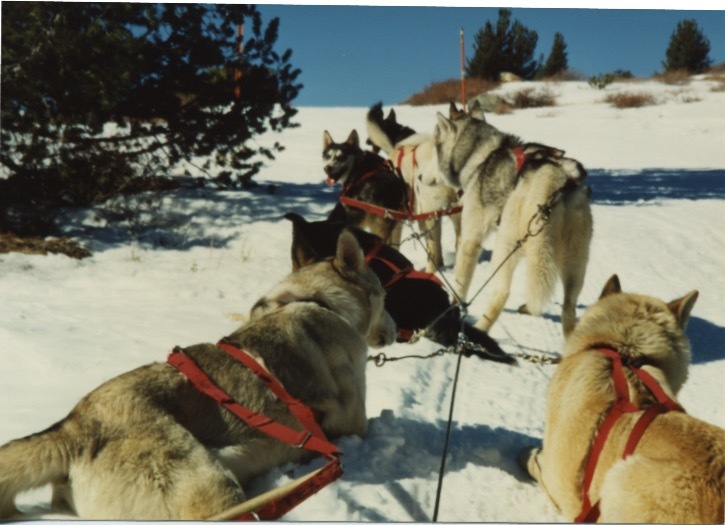 The sled dog owner puts the big dogs in the back to pull the sled and the small dogs in the front. The dog on the front left is the lead dog who follows the owner’s commands. The dog on the front right is learning. 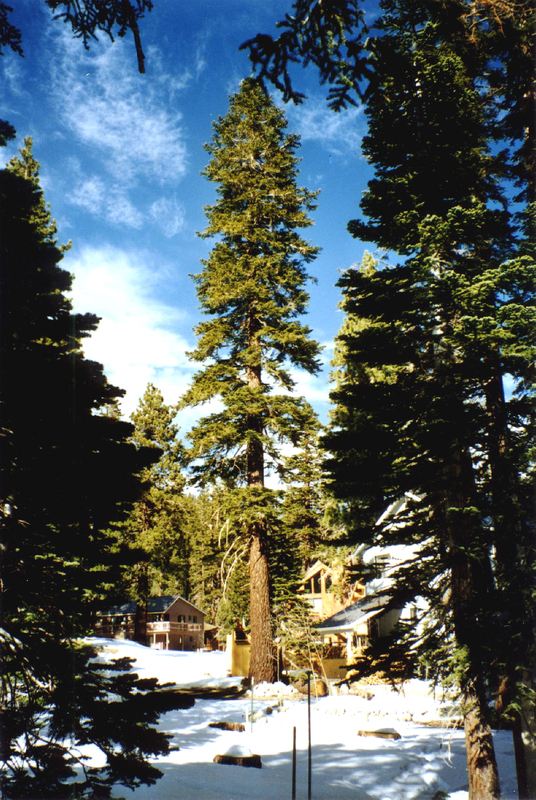 The owner of this house in the Mammoth Lakes community, on his phone answering machine, said he was out back feeding the bears. 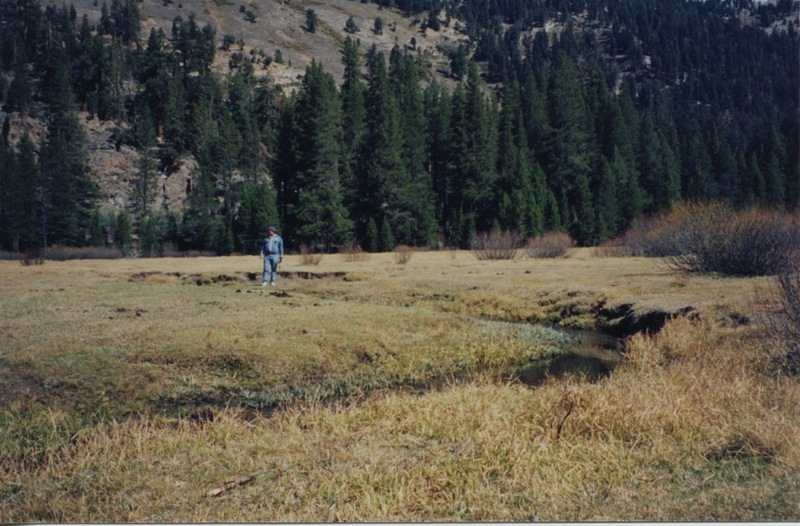 This is Juniper Ridge, where they were planning a housing development. 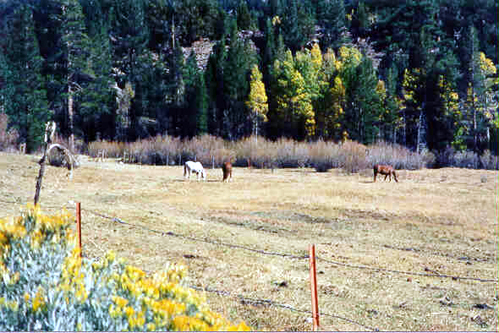 Horses in the Agnew Meadows area, near Mammoth. 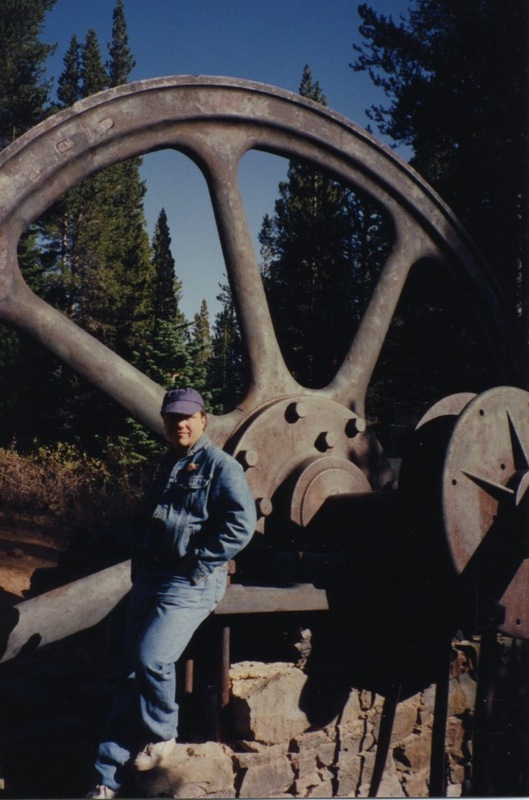 My friend Roland at Old Mammoth Mine Stamp Mill. I visited another gold mine in Mammoth with another friend. I went inside. I hadn’t gone far when it occurred to me that there could be an earthquake, so I turned around and came out. 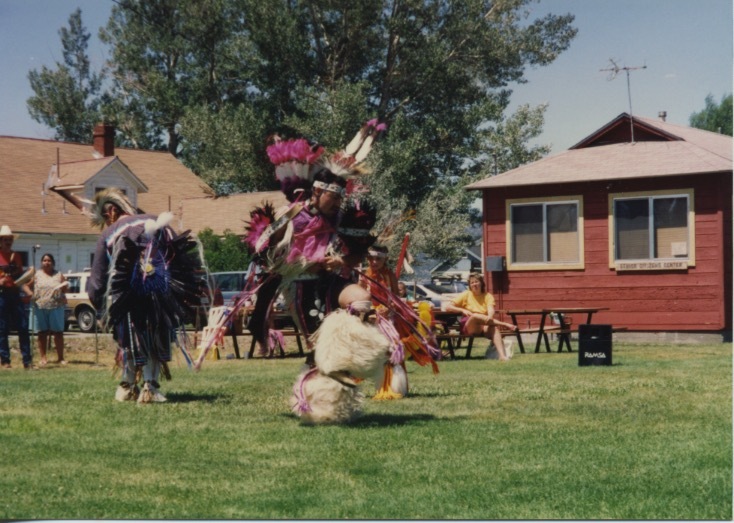 American Indian dances at Bridgeport, Calif. Unfortunately, my camera couldn’t zoom in close enough to capture the vivid colors of the Native American attire. My friend and I spent a wonderful, hot July afternoon — 90-some degrees F, but no humidity — among these people. I bought a silver ring from a Shoshone woman who had made the ring from a Navajo mold. 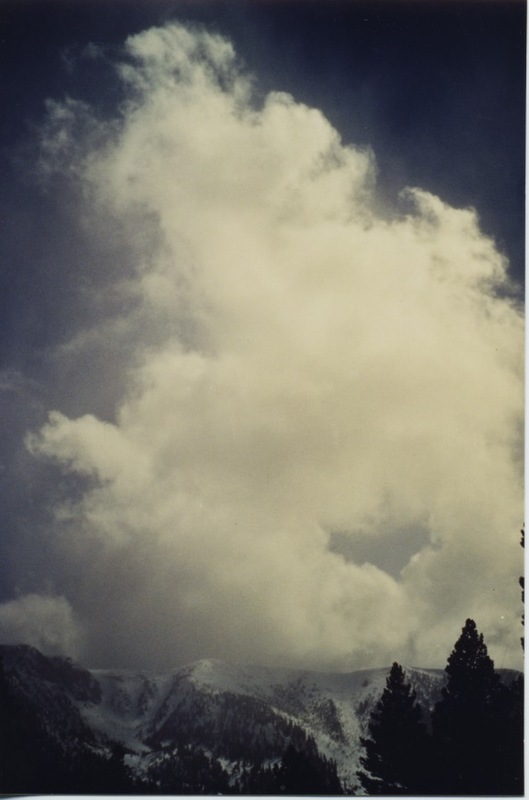 The photo above of a snow cloud and the photo below, both of the Sherwin Mountain range at Mammoth Lakes are prints made from slides, and I haven’t been able to get the color and lighting just right; but I like the scenes.